Rhys Webb is a promising up and coming scrum-half who plies his trade for the Ospreys. He took his bow for the Swansea side back in 2007 and pushed his way into the starting XV during the 2008-09 season with Mike Phillips and Jamie Nutbrown both struggling with injury. He was called into the U20 Wales squad for the 2008 U20 Six Nations and turned out three times before joining the team for the 2008 Junior World Championships. He was a member of the squad which won the 2009 Sevens World Cup and continued with the Sevens setup until 2010. 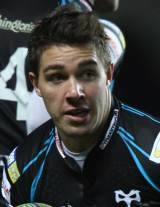 In January 2012, Webb was awarded a place in the 35-man squad for the forthcoming Six Nations.